This article is about the body which oversees elections in Pakistan. For similar title in other jurisdictions, see Election Commission. 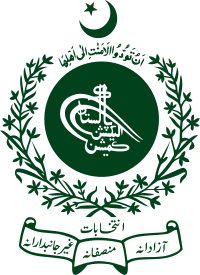 The Election Commission of Pakistan (Urdu: انتخابی دفتر پاکستان‎), is an independent, autonomous,permanent and constitutionally established federal body.Responsible for organizing and conducting of elections to state parliament, provincial legislatures, local governments, elections to the office of President of Pakistan, Delimitation oc Constituencies and preparation of Electoral Rolls.As per the principles enlightened by the Constitution of Pakistan,the Commission makes such arrangements as are necessary to ensure that the election is conducted honestly, justly, fairly and in accordance wiith law, and that corrupt practices are guarded against The Election Commission was formed on 23 March 1956 and has been restructured and reformed in various occasions of history of the country. Under the Article 213 & 216, the Chief Election Commissioner and four retired judges of the High Courts from respective four province of the country, whom are appointed by the President in the manner provided in the clauses (2A) and (2B) of Article 213 of constitution. As of present, Justice Sardar Muhammad Raza is the current Chief Election Commissioner. Election Commission of Pakistan have 4 members panel from all the four provinces (Punjab, Sindh, Balochistan and Khyber Pakhtunkhwa) . The Commission transacts its business by holding meetings. All members of the Election Commission have equal status and say in the decisions of the Commission. The Prime Minister & Leader of the Opposition in the National Assembly recommends three names for appointment of CEC & for each Member to a parliamentary committee for hearing and confirmation of any one person against each post. The Commission has retains its independence, full financial autonomy and functions independently of all government control. Without the government interference, the commission performs its functions and conduct of nationwide general elections as well as for the by-elections which is decided by the chief commission or the Election Commission itself. The preparation of polling schemes, the appointment of polling personnel, assignments of voters and arrangements for the maintenance of law and order are under the control, supervision and directions of the Election Commission. During its rulings and judgements in the case " Election Commission v. Javed Hashmi, the Supreme Court held that "in the election matters the Election Tribunals which are to be appointed by the Chief Election Commissioner" have exclusive jurisdiction and the jurisdiction of all courts in such matters was excluded. However, this is subject to an exception that where no legal remedy is available to an aggrieved party during the process of election or after its completion, against an order of an election functionary which is patently illegal jurisdiction. The effect of which is to defranchise a candidate, candidate can press into service Constitutional jurisdiction of the High Court. The Supreme Court of Pakistan has since then consistently followed this judgment. The Commission transacts its business by holding meetings. All members of the Election Commission have equal status and say in the decisions of the Commission. Judicial review of the decisions of the Election Commission can be sought in the High Court and the Supreme Court of Pakistan if the order suffers from a jurisdictional defect or is mala fide or coram non judice. The budget of the Election Commission is provided by the federal government. Any re-appropriation within the sanctioned budget can be done by the Chief Election Commissioner without making any reference to the Finance Division. Funds required for preparation of electoral rolls and the conduct of General Elections and by-elections are provided in lump sum by the Finance Division according to the requirements of the Election Commission. Further distribution of funds to the various functionaries is done with the approval of the Chief Election Commissioner. The Election Support Group, an internationally supported group of interested parties, made 32 specific recommendations to the Election Commission based on the recommendations of 16 international organizations. A meeting was held in October 2009 to present these ideas to the Commission. The Commission commissioned ESG to provide them with a recommendations on how to best solve the addressed problems. Also, in 2006, the International Foundation for Electoral Systems implemented a 9 million dollar contract through USAID to install a computerised electoral rolls system for the Pakistani government. 1 2 Administrators. "1956 Constitution". Story of Pakistan. Retrieved 2 January 2013. ↑ Const Pakistan. "PART VIII (contd) Elections Chapter 2. Electoral Laws and Conduct of Elections". Constitution of Pakistan, Chapter II. Retrieved 2 January 2013. ↑ CEC. "Message from the Chief Election Commissioner". Chief Election Commission Secretariat. Retrieved 2 January 2013. ↑ "Chapter 1: Chief Election Commissioner and Election Commissions". Constitution of Pakistan. Retrieved 3 January 2013. 1 2 Shaheen, Sikander (December 1, 2011). "ECP seeks full autonomy". The Nation. The Nation. Retrieved 3 January 2013. ↑ Dawn.COM (14 September 2012). "President Zardari gives green signal for election preparation". Dawn News. Retrieved 3 January 2013. 1 2 3 4 "ELection Commiccion of Pakistan". ELection Commiccion of Pakistan. ELection Commiccion of Pakistan. Retrieved 3 January 2013. ↑ International Foundation for Electoral Systems (2009). "Election Support Group". Retrieved October 25, 2009. 1 2 "CEC-ESG discuss Electoral Reforms Recommendations". Islamabad: The Associated Press of Pakistan. 12 October 2009. Retrieved October 25, 2009. ↑ Computerised electoral rolls system installed Daily Times (Pakistan), September 10, 2008. Accessed July 23, 2009.